Opening up about mental health issues is still rare in the workplace, even more so in the stout-hearted world of turf. STRI deputy grounds manager, Tim Randall, talks honestly about his personal experiences. STRI: When did you first experience issues with your mental health? Tim (TR): In 2002, I became a golf course manager for the first time, which led to me experiencing an element of stress. However, it was the introduction of a new member of staff, who did not appear to be very well qualified, that had my stress levels sky rocketing. He was fine to start with, but over time he became more and more awkward and he refused to do jobs he didn’t like. His behaviour worsened towards me, becoming threatening, belittling me in front of other staff, not doing what he was supposed to, and he made my life a living hell. I didn’t know how to manage him, or how to deal with the situation. After four years, he was eventually sacked for professional misconduct, in a matter that wasn’t related to me. STRI: How did your stress manifest itself? TR: One day I just lost it completely. I remember being on my knees outside the clubhouse on the 9th green, just picking at the grass, and I completely broke down. I felt shattered and I just stayed there. I eventually rang my wife, she took me straight to the doctors who signed me off work for four weeks. I did see a counsellor for a period, but I don’t think that was the way forward for me. The catalyst had to be removed for my stress and depression to alleviate. In a capability meeting with an HR manager, I just broke down in tears. She agreed that I wasn’t ready to go back. It was only after seven weeks, that one day I suddenly felt better, and I had more energy. For me the key to getting better was complete rest away from work, only doing simple tasks around the house whilst I was off, and the support of my family. The sad thing is that my memory of the long period leading up to my breakdown is very fuzzy, and I have also lost memories of my young family growing up at this time. STRI: What do you think are some of the reasons greenkeepers feel under pressure? TR: Greenkeepers are under pressure because of reduced budgets and increases in the costs of materials and machinery. Many golf clubs, if they lose a member of staff, don’t replace them, and that heavy workload falls to the remaining team. It is also very difficult to find replacement staff as there are fewer people entering the profession. It’s seen as a career for younger people because of long hours and physically demanding work. There are also pressures from members to play in all weathers, who want to get on the course 365 days of the year. Whereas once courses were closed during winter, now there are golfing competitions and winter leagues. It’s incredibly difficult to keep a course open, and in good condition, when you are fighting the weather. STRI: Do you think you can tell when a colleague may be suffering with mental health issues? TR: I think that people’s body language changes. Their posture can be different, and they can be generally more lethargic. There are also physical symptoms such as skin outbreaks. However, I think lots of people try to hide it and sometimes overcompensate by trying to appear unusually cheerful. A lot of people find themselves comfort eating too. STRI: Self-harm or at worse case suicide is a very real problem in the greenkeeping industry isn’t it? You have spoken to people who are struggling with this on a daily basis. TR: Yes, it absolutely is a problem in the greenkeeping industry, as I’m sure it is in other industries also. I attend a group which was set up by BIGGA for greenkeepers who have all experienced severe depression, and some of whom have contemplated suicide. I think it’s of great comfort for people to be around others who are going through, or have been through, the same thing. You ultimately must question whether the job is worth the stress you are going through, which can be heart-breaking in a vocational job such as greenkeeping. There are a lot of people suffering out there, and it needs to be addressed sooner rather than later. STRI: If you are feeling stressed, what can you do to combat it? TR: An understanding employer is a must. One who understand that people are under pressure in all kinds of different ways. Whether that’s pressure in or outside of work, because that pressure outside of work will ultimately come to work too. Other than that, I have found running or sporting activity helps to improve my mood. I think the main thing is communicating with people. If you can find someone to talk to, it can make a huge difference, both at work and at home. For example, my son was getting stressed recently and through talking we discovered it was simply that he missed his friends at his old school, and we were able to help him see them more often. STRI: What can you do to help your colleagues? actively encourage everybody to ask questions. This way, we are creating a more open environment in which people do not need to hide work concerns that they might have. STRI: What policies or procedures could be put in place to help reduce pressure on greenkeepers? TR: I think pressure could be reduced on greenkeepers by an external group, whose members could visit golf courses and help mediate between the golf course manager, the head greenkeeper, and the committee. This might help to build bridges when normal communications are failing. It would be helpful to have a manager from another golf course for example, assist in explaining the point of view of the greenkeeper to the membership. I also believe it is important for golf clubs to engage a human resources manager or department so that the course manager has someone to talk to if he is unable to speak to other members of the golf course team. It can be a very isolating job and having someone who is there specifically to help resolve issues is essential. STRI: How can the golf club management help? TR: The membership need to be informed regularly by the greens chair and the greens committee about what is happening on the course and why. 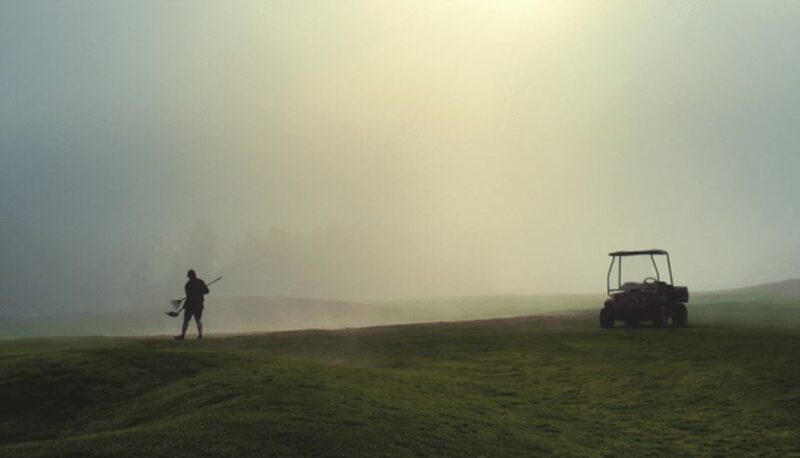 For example, if there are health and safety issues in play, such as the course being closed due to fog, then the membership need to be advised of this. Lack of good communication to the membership may be a result of the head greenkeeper not working well with his greens chairman or captain, and sometimes those relationships can become fractious, but it is important that lines of communication between these parties remain open. Another consideration is how to best place such announcements so that the membership will easily be able to find out information about the course. Messages on noticeboards might be missed, or more elderly members may not use, or have access to, social media. Ultimately, I think that the golf club management need to show support to their greens team in front of the membership. STRI: When should you start telling problems to senior staff/club members? TR: I think that in the first instance it’s a health and safety matter, so if you notice that a colleague of staff member is not taking care of him or herself, then it may be time to speak to someone senior at the club. Perhaps if they are often late to work, or looking unkempt, or that their quality of work has deteriorated, it may be an indication of a mental health problem. More clubs are sending their staff on first aid courses, which is great but may not have policies or procedures in place to help people deal with mental health problems at work. BIGGA has information available, but I also think that potentially organisations such as The R&A, Golf England, or even us here at STRI, could collaborate to help to inform golf clubs by creating a document which identifies mental health problems that exist within the greenkeeping industry. If you would like to speak to Tim about mental health issues go to his very popular greenkeeping group on Facebook where he can be contacted directly.